Every girl and woman carries makeup and cosmetics in her purse. Why not carry your makeup in these beautiful custom made and personalized makeup bags. These cosmetic bags also make a great bridesmaid gift. Our makeup bags are available in 2 sizes, small for smaller purses and less makeup, while the medium one for larger purses, as well as more makeup. Neither one of these is big enough for me when I am traveling - so, we do carry custom toiletry bags for travel. 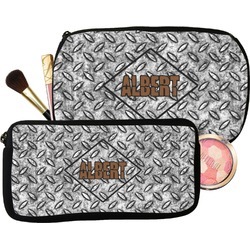 Our personalized makeup bags are available in many different designs, patterns and colors - so you are sure to find one that will love. They are made of neoprene (same material as wet-suits) and thus are water resistant, so spillages in your makeup bag will not end up all over you purse. They are customized on one side and are black on the other side and the zipper is black as well. I ordered the small buzzing bee makeup bag. They emailed me within a day with the link to the customizing it web page. Customizing it and making changes was pretty simple, lots of options. Though after I clicked final submit there was no return email or confirmation number (etc) to really be sure it went through. Shipped fast. Perfect size for my travel makeup needs. Or keeping my checkbook and receipts in. Honestly want a second one, and a larger one. Photos: The hair elastic is to block my name. I have a crappy camera on my phone so it looks warped in one of the photos, the bag itself is not warped in anyway. Great cosmetic bag...bigger than I expected it to be. The only downfall was that the print was just on the front and the rest is solid black, which the pictures dont show you. But I bought this as a maid of honor present for my sister and I still think she is going to love it! Update: My maid of honor absolutely loved it. She loved the design, the colors, the personlization....everything!!! I sent her. She is just now allowed to start wearing lip gloss and very "light" make-up. Well made and absolutely perfect. It scored as a top-rated Christmas gift in her book.